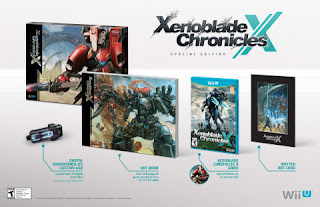 Unique to North America, this Xenoblade Chronicles X Special Edition is now available for pre-order at select retailers nationwide. Xenoblade Chronicles X comes from acclaimed developers Monolith Soft, the creators of Xenoblade Chronicles for the Wii console. In this new game, Earth is destroyed and humanity faces annihilation from an intergalactic war between two alien races. Players must fight for their survival and explore a new planet full of exotic and hostile life-forms. To traverse the planet with ease, players can pilot customizable mechs called “Skells,” which give them powerful weapons. Players can also customize a lethal skill set of combat and defensive skills called Arts to strengthen their strategies and defeat enemies efficiently.